As a whole September was hectic (much more hectic than I prefer! ), but fulfilling. Jennifer started full-time and handles a ton of the stuff that I don’t need to be doing but is still important. She’s AMAZING at customer service, learning quickly and managing all of the random tasks pulling her in different directions. We also had Fincon this month (more on that in a minute), which means I took a week off and spent it in sunny San Diego, California geeking out with fellow financial bloggers (and reading Lauren Greutman’s new book The Recovering Spender poolside). This month was hectic but hugely fulfilling. We had a lot of big moves this month. The SEO intensive, Fincon, growing a team, but the biggest impact was EBA VIP. I joined EBA VIP, which is a mastermind for advanced bloggers that have taken Elite Blog Academy. It came with a $2,000 price tag and in the first 2 weeks of the group, has already proven to me that it’s worth the investment by far. 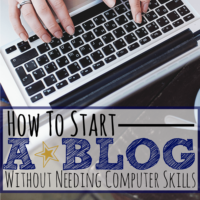 The bloggers in this group are hugely motivating, knowledgeable and passionate. Ruth Soukup (from Living Well Spending Less and the creator of Elite Blog Academy) is personally involved in the group and has already helped me redefine my goals and action steps. This set a fire in me like you wouldn't believe. I consider myself to be pretty awesome at goal setting (I took Productivity for Bloggers in the beginning of the year and it made a massive difference in the way I run the business and got me into batch blogging), but Ruth took my scattered goals and made them focused and smart. If you aren't already on the waiting list for Elite Blog Academy (which *is not* $2,000 thankfully! ), then join now. This minute. Then thank me later, You can join the waiting list here (I’m hoping for it open in early 2018, but it’s not mine, so I have no control over it). The best part? 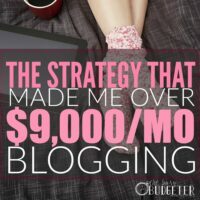 Blogging is a super cheap (almost free!) hobby that makes you money! 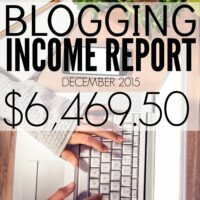 Starting your own blog isn’t very expensive! 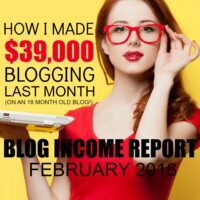 Starting a blog that makes you money while working from home starts at about $3.45/month! All in all, it was a solid month for income, considering the drop in Pageviews. I’m still trying to figure out where the drop came from. If it was a Pinterest algorithm change or something else. When I compare last year to this year in Google Analytics for the same period (which you can do by adjusting the date and clicking “compare to” right underneath the date), I see an almost identical pattern, which is weird, because I don't remember that last year. See what I mean in the photo below? Have you seen a similar dip in traffic in the last two weeks? Because I’ve stopped coaching, I released my Pinterest Strategy Guide in PDF form to you. Which means that you can spend a fraction of the price that coaching costs and get my step-by-step Pinterest Strategy Guide direct to your inbox right now. My goal was to be at least a month ahead by the end of September. Rocked it! I’m scheduled to November and working on December now! I wanted to stay on-task and complete the SEO intensive as we outlined, which should be easy since I have the others in the group to hold me accountable. Done! We just completed the first month! SEO Training: I’ve been working through a three-part SEO training, That starts with a month of foundational training of Google Analytics in skyrocket, goes into Webmaster Tools training, and then finally implements a solid SEO strategy. I’ve been thrilled with it and love their step by step action steps way of teaching. My pages per session are up almost 5% from before we started, my average session duration is up 11.37%, and my bounce rate is down 2.2%. I reviewed a TON of SEO courses before choosing this one, and I’m glad I did. It teaches me in a way I can understand without overloading me with info that I don’t need right now. You can start your own SEO Intensive by grabbing a copy of Skyrocket here. Fincon, This conference for personal finance media is AMAZING. If you write about money, you should be there. It’s an incredibly friendly, open conference where people openly talk about income, net worth and what's working and not working, There’s no celebrities (okay, there are- but they don't act like it), and everyone is warm and welcoming. Plus, they’re the single best resource I’ve found for questions. The collective knowledge in this group of thousands in unbelievable. From underwater homes, serious investment strategies, retirement planning, right down to debt management, there's someone in Fincon that knows everything about money. And they’re happy to help. Plus, it’s fun. And I’ll be there! You should totally come. I’m way more awkward in real life, but we’d have a blast together anyway. Infusionsoft: I’m still holding out hope for this one, but they’ve been building my system for two months and I have yet to be able to even get into it. I’m starting to second guess myself. Communication on setup has been incredibly slow (like 10 days of my emails ignored) and reaching out to their HQ to problem solve left me unsatisfied. I’m still crossing my fingers that their actual service is different than the onboarding process. Facebook: With just under 6,000 sessions a month coming from facebook, I think I’m throwing in the towel on that for a while. While I understand that facebook is too big to ignore, I can also tell you VERY clearly that if you calculate the ROI of the time I spend there, it’s not even remotely worth it. I wish I had focused more on SEO instead of facebook in the last year, but lessons learned right? I’m choosing topics and headlines for both Pinterest and SEO at this point, even understanding that I won’t see a payoff for my work in SEO for 9 months or longer. Take and implement the Dominate Webmaster Tools Course (as part of my SEO Intensive). This should be easy to do since I have an accountability group in the SEO intensive that keeps us on task. We separate the challenges into weeks and complete the tasks every week before our meeting. Update: The below is still true, but I’ve stopped focusing on sponsors right now, with the exception of a few brands that I want to build long term partnerships with. Having the core list lets me easily track special sale dates that my readers shouldn’t miss and lets me focus without getting overwhelmed with the barrage of affiliate “offers” hitting my inbox daily. Glad to hear about your income very motivating. My September was not as great and it seems like is not getting better. I blame this on my terrible time management. One thing I’m focusing on is less sponsored posts and going back to what I love, writing about my financial journey. Later on I will look into Skyrocket and start working on that. To this point, I have made a little income with Amazon affiliates and a few affiliates for products that i really love. I don’t like ads so don’t put ad networks on my blog. I guess I didn’t know I was doing a Core Affiliate Strategy but I kind of am. I emailed my list this week instead of the usual RSS feed and promoted the Genius Bloggers Toolkit and actually got a few sales, small victories! I am working through EBA 2.0 and I really needed that reminder to put EBA first for the next year. I’m still in Unit 2 and really trying to do a good job before moving on. 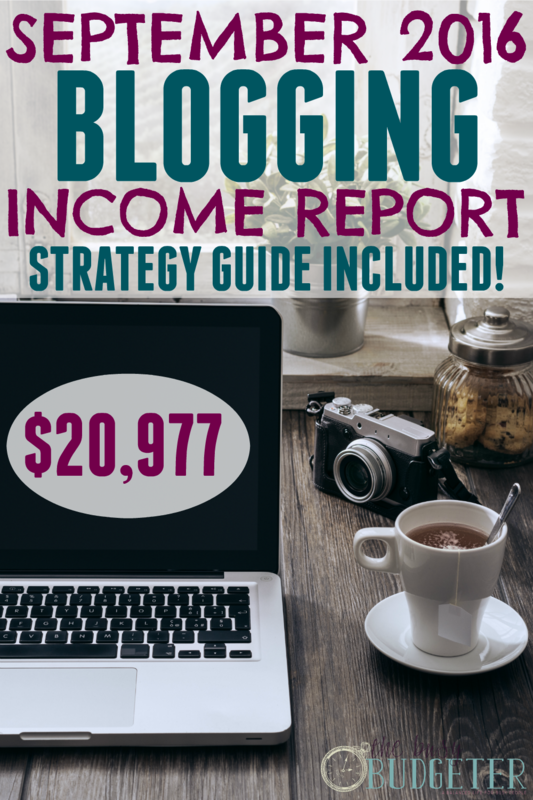 Thanks for sharing your income report, it’s inspiring! I’m just starting out and I am super pumped up! So encouraged after reading your information! Thank you for sharing! Income reports are really helpful for deciding where to spend my time and efforts. It’s also very encouraging! What do you think of starting an anonymous blog? I’d love to start one but my biggest issue is I’m a private person and I don’t like everyone to know what I do and think etc.